Your fireplace transforms your living room into an excellent, cozy place to relax after a long day. However, simply kicking your feet up in front of the fire, day after day (without completing key care tasks and inspections) can result in disaster. Creosote buildup, a byproduct of wood combustion consisting of tar and other flammable substances, can cause fires to start in your chimney and spread across your home. To prevent this, you need to check for common problems and have your fireplace regularly serviced by a professional. Otherwise, you may end up needing help from experts skilled in fire restoration to clean up the resulting disaster. Over time, creosote builds up on the inside walls of your woodstove, fireplace, and chimney. This sticky substance contains highly flammable compounds that can catch fire instantly. This layer develops as condensation builds on the inner chimney surfaces – and ash, unburnt fuel, and chemical byproducts stick to it. With a quick look inside your fireplace and up the chimney, you can see the telltale brown and black buildup on the inner surfaces. Both the look and the smell of your fireplace can signify the need for creosote removal. And don’t fall under the impression that these risks only affect wood-burning fireplaces. Gas fireplaces produce creosote, as well, and therefore carry the same risks as their wood-burning counterparts. Whether you use natural gas or propane fuel, these fireplace designs produce even more condensation than wood-burning ones do. The increased water vapor greatly accelerates creosote buildup. Gas fires also tend to allow incomplete combustion that sends unburnt fuel up the chimney where it sticks to condensation on the inner walls. This creates an extremely flammable environment that could easily catch fire. Birds and animals can also increase your risk of fire by bringing debris into your chimney. Debris, critters setting up potential nests, and even nearby tree branches all put you at a higher risk for a fire. The main risk factors of chimney fires are highly preventable. You just need to commit to a regular maintenance schedule to mitigate your risks. The Chimney Safety Institute of America recommends that you inspect your fireplace and chimney at least once per year. During this check, you should verify that its structure remains sound and free of creosote buildup. As creosote can damage your masonry with its acidic substances, setting up a regular care routine is really a win-win. When having your chimney cleaned, hiring a professional to physically sweep the inner surface is your best bet. You can help keep buildup to a minimum between service dates by burning special logs and other products designed to remove creosote. Without the removal of creosote buildup, the tiniest spark could set the whole chimney on fire. These fires are virtually impossible for homeowners to put out themselves. While waiting for emergency services, chimney fires have the potential to rage out of control and spread into the living space. If the house is not lost, crews skilled in fire restoration will need to come to repair the damage. Efforts to put out the fire can take a serious toll on your home. The water used to squelch the flames can result in the need for flood damage cleanup, as well. Leaving the water to dry on its own can result in mold growth that further compromises the condition of your living space. At that point, you would need to get water mitigation and mold remediation services from disaster and fire cleanup companies to fully repair the damage. You can greatly reduce your risks of chimney fires with regular inspections and maintenance services. When you put safety above all else, you also help preserve your comfort and convenience for the long-term. Even with your best efforts at maintaining a strict upkeep schedule, the risk of fire is always there while using your gas or wood-burning fireplace. If a fire ever does start in your chimney, evacuate your home and immediately call 911 to request aid from the fire department. If restoration is possible, you can receive helpful guidance and support from a local fire cleanup company of your choosing. They will use the leading fire damage restoration techniques to restore the condition of your home. In addition to handling fire and smoke cleanup, these companies also take care of the damage caused by the crew tasked with putting the fire out, including mold remediation. While working to restore your home to pre-fire condition, they will even deep clean your furniture upholstery to remove water, soot deposits and the strong odor of smoke. You can receive 24/7 emergency service from your trusted fire and water damage restoration company by calling 972 986 7677. Our highly trained restoration experts can clean up disasters of any size, so reach out anytime you need help. Pets are adorable, but let’s face it, a lot can happen to your carpet over a short period of time if you have a pet or two. Perhaps you have a playful puppy or kitten that hasn’t quite figured out that your carpet is not the same thing as your lawn. Or, if you are lucky enough to have a pet that knows the difference between carpet and grass, you’re likely still dealing with shedding, dander, and the all-too-common mud tracks coming in from outside. Long story short, if you have pets, your carpet probably doesn’t smell (or look) as good as it did when it was originally installed. Of course, pet ownership is worth the work that goes into it, but you’ll need to take a few extra steps to keep your house clean for you and any guests you have over. Sure, it can be a lot of work - but don’t sweat it - it’s manageable, especially with the help of an experienced professional! Read on to learn how to keep your carpet clean despite your pets being, well… pets. Have a puppy with a long tail? Spillage accidents are bound to happen whenever you have a new pet running around. Of course, it’s cute when your puppy is happy, but when that turns into their happy, wagging tail spilling your coffee off the coffee table, it’s just a little less cute. First things first, catch these accidents as soon as possible to prevent the spots from taking hold on your carpet (especially if you have light-colored carpet). When solids (such as food) fall on the floor, use a dustpan to remove what you can, then cover the stain with paper towels. Once the area is dry, clean it with warm water to prevent discoloration. Expert Carpet Cleaning Tip: If the spill happens at night or when you are away at work, use a combination of vinegar and cold water once you spot the spill to remove the odor. Follow this up by scrubbing the area with a good carpet cleaner. Vacuuming is your best line of defense when trying to remove pet hair from your carpet - both visible and hidden in the fibers. Even if your pets don’t shed fur, they may still be shedding dander (the allergy-causing particles in their coats), and, if you live in a typical household, dust and food particles are thriving in your carpet fibers and creating odors that are… less than desirable - to say the very least. The next time you are vacuuming, move your furniture towards the edges of the room so that you can get to the whole length of the carpet (depends on the layout of your room). In addition, pet hair can travel underneath the furniture, especially if you have a nearby air vent or fan, allowing odor-creating particles to hide long enough to put off an unpleasant odor. Pro Tip #1: For the best results, use duct tape before vacuuming to pick large chunks of hair. If you don’t have a roll handy, there’s always a DIY solution! Try wetting your kitchen rubber gloves and running your hands quickly through the carpet to pick up the pet hair. Pro Tip #2: One other thing to keep in mind is that pets drool all over their toys, so clean those toys relatively often so smelly saliva residue doesn’t have a fighting chance at ruining your movie night. If you walk your pets often, you’ve probably realized that most of the dirt on your carpet comes from outside. Don’t worry - there’s a quick fix for this problem! Place a towel or a small rug at each outside entrance to your home/apartment, or living space. When you get back from your walk, wipe the pet’s paws before setting them free to roam inside. Some pets might resist the new routine at first, but after a few weeks, they’ll have it down (and so will you)! No matter how well trained your pets are, they are bound to urinate on the carpet from time to time. To clean it up, start by laying a small towel over the patch. How Do I Clean Pet Urine Off Of My Carpet? As the urine absorbs into the towel, mix some warm water with your dishwashing liquid and pour it on the stain and rinse the stain with a clean towel and warm water. Finally, lay some paper towels on the stain to absorb moisture and rid your carpet of any odor. Voila! Tip: For vomit stains, pour some club soda on the spot and let it sit for 30 seconds. Next, soak up the stain with a dry cloth. Repeat this until nothing is being transferred to the cloth. Have you ever sat down on your carpet, taken a sniff and thought, “this smells like a dirty dog”? If you have, it’s probably an indicator that you need to groom your pets more often. Bathing your pets regularly will definitely help to keep the rugs odor free. Also, trim their nails (but be careful not to trim too much). Long pet nails can damage carpet fibers and spread them all over the place. Keep up the grooming and brush your pets regularly (outside) and your carpet will look and smell great for much longer! By now you have probably noticed that pets and carpets are not exactly a match made in heaven, and sometimes things may get out of control. For example, if you have sick pets in the house, they may puke or relieve themselves on the carpet. In some of these incidences, the odor may be too much for you to eliminate on your own, which is where a professional pet odor removal company comes in. Pet odor removal companies have the necessary products and experience to handle stubborn odors and stains. Before freaking out and deciding to replace your dirty carpet, give a professional pet odor removal company a call and let them work their magic. From the moment you adopt a pet, you have your work cut out for you. Feeding and bathing them is part of it, but so is keeping your living space clean with them around. While the tips above will come in handy, do not hesitate to call a professional carpet cleaning company for more advice on how to keep your carpet clean. Carpet mold often grows after water damage either through flooding, broken water pipes, and/or roof leaks. It's often hard to tell if you have mold as it can grow under the carpet. Carpet fibers are porous, which means that things (like water) can easily seep through them. After water damage occurs, the carpet fibers absorb water - creating a moist, inviting environment for mold growth. Mold growth starts after 24-48 hours after water exposure. The early mold population rapidly reproduces by releasing microscopic spores (tiny lightweight “seeds” that travel through the air), and if left unchecked they can spread all over your living space in a matter of days. Read on to learn how to detect mold, and how you can stop mold growth right in its tracks. Given their rapid spread, it is important to identify mold growth on carpet early and call in a home mold removal company. Below are five common signs that your carpet has mold. Although mold is likely to grow deep into the carpet where it is hard to see, in its advanced stages you may notice black, white or green spots (similar to what you see when you leave bread out for too long). Any slight discoloration should be investigated further and should not be dismissed as mildew (see below). Mold tends to appear in shades of green, blue, or red. Mildew (a type of fungus) typically appears in shades of white. If the mold contamination advances to the extent that it is visibly staining your carpet, contact an in-home mold removal company to see if they can help salvage the carpet. If the carpet can’t be salvaged, dispose of and replace it immediately. If you’re concerned about mold, even if there is no evidence of mold growth at the top of your carpet, regularly inspect your carpet’s underside for signs of mold growth and dampness. A bad odor is the first sign of active mold growth in your home. The odor might not be immediately apparent if you spend most of your time indoors. Take note of any visitors’ comments on a musty smell and take immediate action by checking your carpet and the rest of your home for signs of mold. Increased allergic reactions including a runny nose, sneezing, breathing problems, coughing, and eye irritation could be indicative of mold infestation. While these symptoms should always be immediately brought to a physician’s attention, you should follow up that doctor’s visit by having your house thoroughly inspected for the presence of mold. A carpet that has been subjected to water damage either from flooding, standing water, or spillages should be either cleaned and dried within 24-48 hours or be disposed of. If you notice wet or damp spots on your carpet, it could be as a result of leakages beneath it. Inspect the floor for signs of leaks and have the carpet cleaned and dried immediately. If you suspect that your home is infested with mold, an easy way to find out is by using a mold testing kit. While you could perform the tests yourself, this is best left to a mold inspector as he or she will be able to determine the extent of the contamination and advise you on the best course of action. Getting rid of mold on hard surfaces such as tiles isn’t easy, to begin with, but removal gets even harder when the mold is embedded in your rugs and carpet. What’s the best way to deal with carpet mold? - You guessed it: don’t let it happen in the first place. Keeping the humidity levels in your home low is the first step towards retaining a mold-free carpet. The EPA (The Environmental Protection Agency) recommends that home humidity levels be kept at around 30% to 50%, with 60% being the highest desirable limit. The easiest way to achieve this is by using a dehumidifier. If you don’t have a dehumidifier, you can substitute in regular fans, or just open the windows to ensure that there is constant air circulation. Though obvious, this is an important one to keep in mind. The strongest preventative measure you can take against mold growth on your carpets is - you guessed it - keeping them clean. Keeping your carpet clean is one of the most effective mold mitigation measures and an easy one at that. Generally speaking, there is no measurable way to determine how clean your carpet needs to be, but at the very minimum, you should be vacuuming your rugs and carpets every week. On top of that, you should hire a professional carpet cleaning company at least once per year to deep clean your carpets and rugs, getting rid of any inactive mold spores and other toxins that are waiting for a spilled glass of water to thrive. And, if you haven’t been keeping up with a tight cleaning schedule, clean and treat your carpet with a carpet cleaner immediately after spillages. Do you think your carpet or rugs have incurred mold damage? 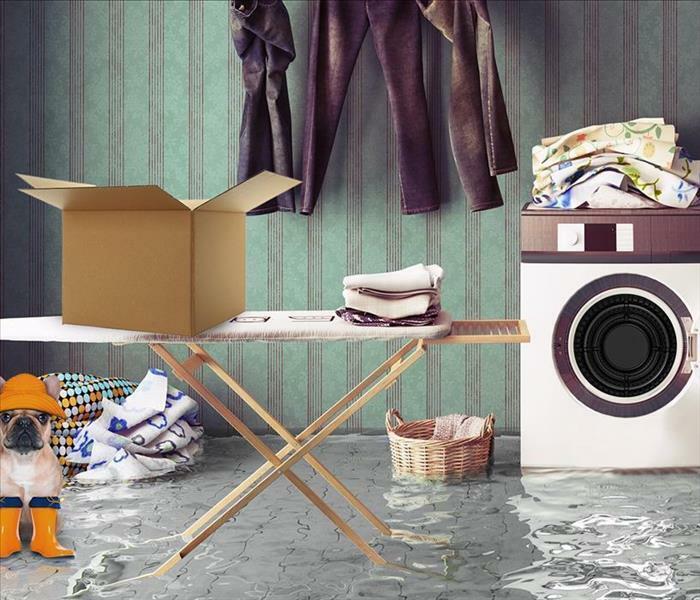 If you experienced a flood, whether it be from environmental factors, a broken water heater, or anything in between, call in a Dallas water damage restoration company to remove excess water and dry the affected surfaces, thereby making it difficult for mold to reproduce. Next, get in touch with a home mold removal company for residential spaces or a commercial mold removal company for business spaces and offices. If you have any health problems, especially respiratory problems, or environmental allergies, you should call in a professional instead of attempting to clean up the mold by yourself. Cleaning up mold exposes you to mold spores that can worsen your allergies. Also, most mold remediation professionals in Dallas, TX offer free consultations in your home. With this in mind, there’s nothing to lose. You only stand to benefit from expert advice about keeping your carpet mold free. Reclaim the ambiance of your living space today by calling in a mold remediation company in Dallas to inspect and clean your carpet. Working with an expert guarantees you of effective mold removal and, most importantly limits further damaging mold spread. To speak with a mold inspector in Dallas today, call us at (972) 986-7677. 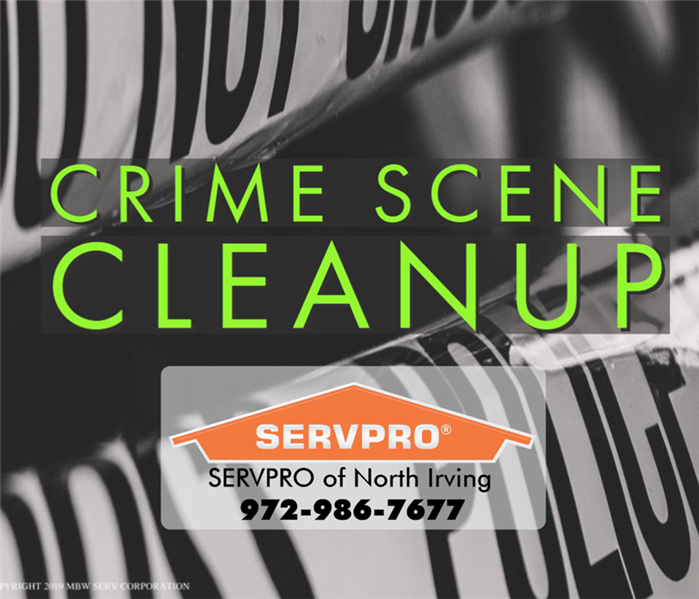 SERVPRO of North Irving is available 24 hours a day for crime scene cleanup, including biohazard situations. We've serviced DFW for over 30 years. There are a number of potential causes that necessitate biohazard cleanups, and sometimes these are the direct result of a crime committed in a residential or commercial property. These crimes can include homicide, breaking and entering, theft, and potentially any crime that occurred on your property. A lot of the information regarding the cleanup of crime scenes that include biological fluids can be read about in more detail in our article "Bio-hazard Cleanup." There are a few key differences and different circumstances that warrant its own topic. The first key difference is that crime scene cleanup is not limited to biological cleanups. We are not solely discussing homicides, but rather any crime committed on the property that requires the services of a professional restoration company. An all too common occurrence is breaking and entering. This could leave your home with a broken window or broken lock. 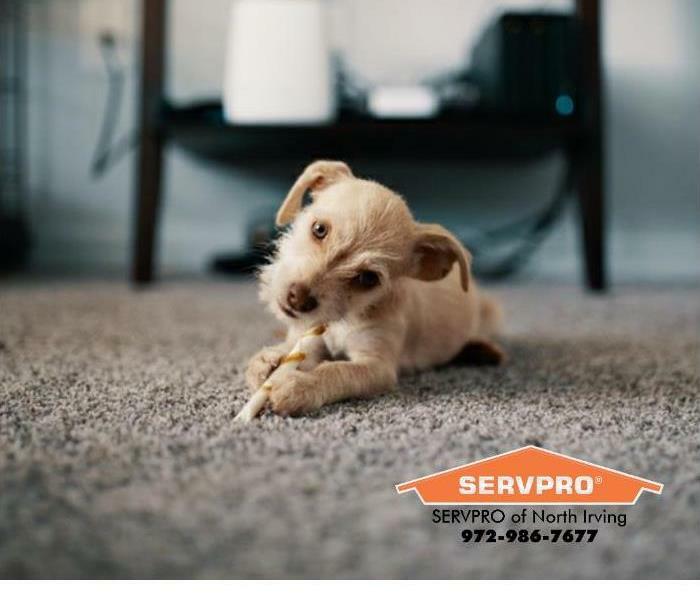 After this kind of traumatic experience, it is important for you and your family’s safety that you call SERVPRO of North Irving immediately and begin the board up process. Board ups include securing wood over a window or door that otherwise are not there or not secure anymore. Board ups deter any would-be criminal activity and are a temporary solution until insurance adjusters and contractors can assess your home or business and rebuild the door or window permanently. Expediency is important. A board up is often times the first step in crime scene cleanup. The immediacy by which you call us can prevent further damages or further crimes on your property. You will be hard pressed to find a window installer that can help when you return home in the middle of the night to find your window was collateral damage after a burglary, and many families won’t feel safe without a window after being the victim of a crime. We’re here to help 24 hours a day. In the hectic scramble that is the aftermath of a crime, keep in mind what work needs to be done immediately. A board up definitely falls in this category. Another distinct difference between a biohazard cleanup and a crime scene cleanup can be the involvement of police and forensic investigators. These people work diligently to find the culprit of the crime, and can oftentimes leave behind cleanup work to be performed. One example would be a black dust-like substance that police use to try and find fingerprints of potential suspects, which is generally called fingerprint powder. They may use this substance on window sills, walls, furniture and other surfaces around your house in an attempt to further their investigation. Cleaning this up, however, is no simple task. More often than not, the use of regular residential vacuum cleaners will not completely remove this substance. Rather, the use of an industrial carpet cleaning machine in tandem with a HEPA vacuum will have to be employed to fully extract the powder. Depending on the surface, the extent to which the powder is spread, and other factors, will influence how much and what type of cleaning work will be involved. A cleaning professional is necessary not just for your biohazard cleanup after a crime but also for the forensic cleanup. The fingerprint powders are some of the most commonly used examples, but police departments and forensic teams are constantly developing new ways to approach a crime scene, and with that comes new cleaning and restoration needs once the dust settles. Similar to the board up process, once you know the police are finished with their investigation, call us as soon as possible as the cleaning of fingerprint dust and other investigative residue is more successful and far easier the sooner we are able to tackle it. A common theme amongst these crime scene tips is to give us a call as soon as you are aware of the crime and restoration service you are in need of. However, during crime scene cleaning, we have to wait for investigations to be thoroughly completed, and for police to clear the scene for cleaning. This applies less to board ups, but more towards crime scenes that involve biological fluids or forensic residue needing to be remediated. Similar to waiting for the Fire Department clearance during fire jobs, we cannot impede upon the Police Departments work at the scene of the crime and therefore must wait for their clearance in order to perform whatever cleaning and restoration services are necessary. 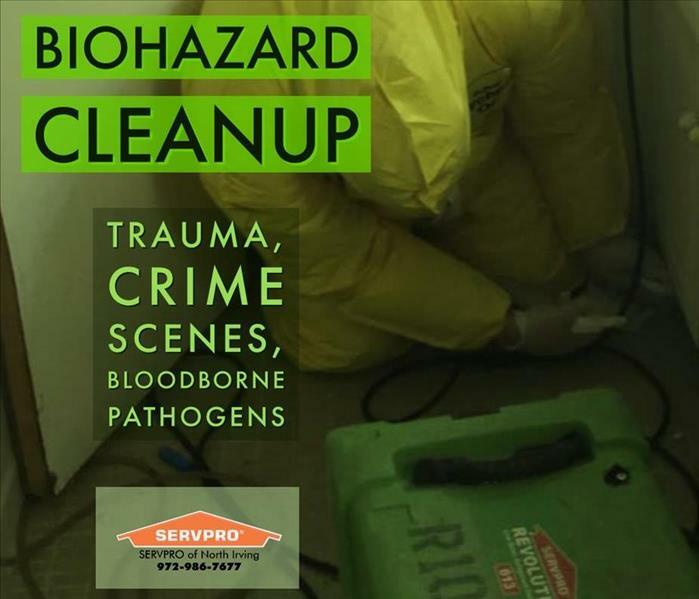 Our team at SERVPRO of North Irving have over 30 years of experience remediating biohazard cleanups, and oftentimes these are the result of crimes. We have cleaned up after, and assisted, many Police Departments in the Dallas area and Ellis County after a slew of different crimes, and we are always ready to help you. Our crews are available dispatch for 24-hour emergencies every day of the year. We can be reached 24/7 at (972) 986-7677. Call us any time! SERVPRO North Irving is a licensed Texas Mold Remediation Contractor. We've served DFW for over 30 years. Mold inspections are a popular request for us. Many families and businesses in Dallas Fort Worth experiencing typical mold symptoms, including allergic reactions, often call us and ask for a mold inspection. SERVPRO of North Irving offers free, no-obligation mold inspections. If you’d like to schedule an inspection, give us a call at (972) 986-7677 or contact us. Ask you to show us where you suspect mold growth. Inspect the trouble area and its surroundings. Inspect areas of a home where there are high chances for growth. If you’ve had previous water damage, mold may grow there, too. We’ll inspect previous water damage areas. Take documentation of any growth we find. If we find growth, we can suggest immediate steps you can take, such as containment and HEPA air scrubbing, while we prepare your estimate. The process for mold remediation depends on the size of the mold colony we find. The process is the same whether we’re handling a household mold problem in a business’ commercial property. Mold clean up in Dallas Fort Worth can go one of two ways according to Texas State Mold Law. Mold of this size does not require any reports be filed with Texas. We can begin mold remediation services immediately. A Texas Licensed Mold Assessor to write a Mold Protocol. We can give you a list of assessors for you to choose from since we cannot, legally, choose one for you. A Texas Licensed Mold Contractor (us) will file a Work Plan and schedule the job with the state. Afterward, we must legally wait at least five (5) business days before beginning remediation. When we finish the mold remediation, the Mold Assessor will check the property and issue a Clearance Document. The Texas Licensed Mold contractor (us) will issue a Certificate of Mold Damage Remediation. This documents the success of the mold cleanup. Setting up mold containment. This prevents mold spores from traveling to other parts of the property. HEPA air scrubbers and filtration to remove airborne spores. Depending on the damage the mold has caused, the mold can either be removed from the surface or the surface will have to be removed. The mold will be bagged and taken away for proper disposal. If any part of your home had to be removed, it can be reconstructed by our team. When Can Mold Removal Happen? Mold cleanup can happen at any time of the day. Many residential homeowners choose to have their mold remediated during regular business hours. Our dispatching team can work on a time and date that works for you. You do not have to be home for remediation to take place. We are happy to install a temporary lock box to work while you’re away. For business owners and commercial properties, we understand mold cleanup has to happen after hours to avoid business interruption. This is a perfectly reasonable request and one that we have granted many times before. Mold cleanup can occur after your employees have left for the day, on the weekends, and even overnight. Simply let us know what your needs are, and we’ll be happy to work out a schedule that works for you. Many people who need mold removal in Dallas wonder how their property became infested with mold in the first place. Mold is a natural part of our environment, and it can not be 100% removed. The goal in proper mold removal is to get the levels of mold spores in the air back to a safe level; this is especially important for individuals who have mold sensitivity. There are also types of toxic mold that should be removed as quickly as it’s found. Enter when windows or doors are left open. Attach itself to your pet’s fur and be dropped when your furry friend lays anywhere in your property. Attach itself to your clothing, including leather. Come in from your HVAC system. Make sure any water damage is properly remediated. Keep doors and windows airtight so no weather can come in. Keep humidity levels in your property low (50% or below). Check for mold growth sporadically in high-growth prone areas to avoid bad surprises. Mold prefers damp, dark, and undisturbed spaces. To grow, mold needs a source of food, and it will often find food in a moist piece of drywall, wood, and even clothing. Knowing mold’s preference for growth gives us valuable clues when we begin investigating your home for mold infestation. When we arrive for mold inspection, we will search the typical mold growth places along with any other area of your home that has experienced previous water damage. We do not perform air quality testing ourselves, but we have great partnerships with air quality agencies in North Texas. If you’d like an air quality test done on your property, we are glad to arrange a test and work with our partners. If higher than normal levels of biological pollutants are found in your property, such as mold, we will inspect your property for its cause. While we are inspecting for mold, we can install HEPA air scrubbers that will filter the air in your property and remove up to 99% of the contaminants. HEPA air filtration will continue as the mold remediation process continues. Air scrubbing may improve the quality of your air while the root of the problem is assessed and removed. You may want to know the specific type of mold that is growing on your property. This is especially true when we find black mold. Testing for a specific type of mold is often unnecessary. When we remediate mold, we treat every kind with the same level of caution regardless of its known toxicity level. The remediation steps for every kind of mold is the same. Often, many different types of mold are found in one location. For these reasons, we do not test for the type of mold unless a customer specially requests it. We will take a sample of the mold we find on your property and deliver the sample to a certified mold testing lab. Results are often quick -- they can be ready and delivered back to you in less than 72 hours. Are you ready for us to inspect your property? You have a few mold removal companies in Dallas to choose from, and we want you to feel comfortable with your choice. If you have questions, contact us and we’ll be happy to answer them for you. We’re available to take your call 24 hours a day. Proper mold remediation isn’t optional, and you need a company with plenty of previous experience and success. We are a licensed Texas Mold Remediation Contractor with over 30 years of service to all residential and commercial properties in North Texas. We’ve helped thousands of property owners, and we can help you, too. 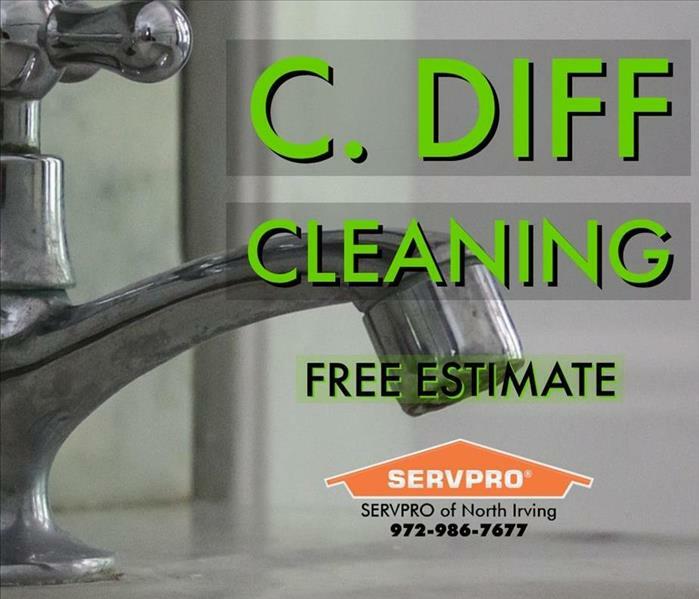 SERVPRO of North Irving offers no-obligation estimates for C. Diff and other biohazard cleaning in Dallas Fort Worth. Adults 65 years or older have a higher risk of becoming infected with C. Diff. When a resident in a nursing home contracts the infection, it’s important to clean the facilities quickly and help stop the contagious bacteria from spreading. C. Diff is an abbreviation for clostridium difficile which is a type of bacteria. The infection affects a person’s colon and commonly causes diarrhea and other symptoms. It can spread by touch or contact with contaminated objects like clothing, countertops, and bathroom surfaces. Some cleaning agents leave a thin film on surfaces. This is normal and a necessary part of the chemical agent to ensure that the bacteria is eliminated. If your residents mind the film, it can be removed after we’ve ensured the dwell time the agent needs to be effective is met. We will deep clean carpets with the appropriate biohazard cleaning agent. In most instances, any stain that was on the carpet will also be removed. The carpet can be dried in a few minutes and is available to use again quickly. This includes sofas, chairs, and mattresses. ATP stands for adenosine triphosphate which is the energy molecule found in living cells. Our office uses ATP testing to verify our cleaning effectiveness. We can swab cleaned surfaces and measure the amount of organic material present. If the test measures positive past the acceptable threshold, it will be cleaned again. Due to the nature of C. Diff and the type of cleaning involved, the cleanup is treated as a biohazard. Our technicians must wear appropriate personal protective equipment and may have to dispose of unsalvageable items in biohazard bags. All cleaning instruments will either be sanitized after use or disposed of at an appropriate biohazard waste facility. When a business needs cleaning services, we are commonly asked if we can clean after typical hours. We can accommodate your nursing home’s busy schedule and work when our technicians can cause the least disruption to your residents. After-hours and overnight cleaning is available. Please let us know of your special request, and we will find a way to make this work for you. The privacy of your business and residents is important to us. The documentation we take, such as photographs and measurements, will not be shared. No photographs of your residents or staff will be taken. We are happy to provide a no-obligation bid for your nursing home. Call us today to schedule a free inspection. SERVPRO of North Irving is an experienced biohazard cleanup company in Dallas. We have cleaned homes and businesses that have experienced crime scenes, unattended deaths, and other types of trauma resulting in bloodborne pathogen cleanup. Our areas of service include all of North Texas including Dallas, Fort Worth, Waxahachie, Grapevine, Arlington, and Plano, TX. To learn more about C. Diff, please visit The Mayo Clinic and MedicineNet.com. SERVPRO of North Irving is a Dallas based biohazard cleaning company. We have serviced DFW since 1986. What is a biohazard cleanup? A biohazard cleanup is a term used to cover a wide range of cleaning that is related to biological fluids and materials. There are a number of causes that could warrant a biohazard cleanup, otherwise known as biohazard remediation. Accidental death, unattended death, suicide, and crime scene cleanup are the most frequent causes that require biohazard cleaning. However, there is really no limit to the potential causes that may require a professional biohazard company to perform bioremediation work. An easier way to approach the question is to take into consideration what needs to be cleaned. Any biological fluid (anything originating from within a human), including blood, feces, vomit, and more, are all potentially harmful if not properly disposed of. Common incidents that require biohazard cleanup involve death. Due to the nature of potential health hazards because of exposure to biological fluids, the cleanup process is thorough and extensive. Our trained technicians are equipped with proper Personal Protective Equipment and specialized tools to clean any biohazardous material properly and safely. The nature and extent of the cleaning will determine the necessary steps in biohazard cleanup. When should I call a biohazard cleaning company? The affected area in a biohazard cleanup needs to be treated as soon as possible. Understandably, in the case of unattended deaths, this may not occur. In many other situations, it is important to call SERVPRO of North Irving and set up a time for cleaning. There are a number of reasons you should call quickly. As biological fluids deteriorate on surfaces in your home or business, they begin to let off an odor that can quickly transform the area uninhabitable. Biological fluids, such as blood, easily seep through cracks and holes. This makes the remediation work more difficult by the day. What one might consider a small issue can quickly turn into an odor that renders the area unlivable. The longer an odor lingers in the affected area, the more drastic measures will be needed to properly complete the bioremediation. If you find yourself asking when you should call about a biohazard cleanup, the answer is probably right now. Why do I need a professional to handle biohazard cleanup and biohazard waste? The longer it takes to get a biohazard cleaned, the more risk there is to anyone in contact with the site of bloodborne pathogens. Biohazard risks are a major concern and the reason that remediation has to be done properly and professionally. In this case, out of sight, out of mind isn't safe. One cannot simply wipe or hose off the affected area and expect the issue to be resolved. In fact, bloodborne pathogens are more hazardous than you would expect. Every 1 in 24 Americans have HIV, Hepatitis B, or Hepatitis C. These diseases, and the risk of exposure, cannot be taken lightly. These bloodborne pathogens can survive up to 16 days after the death, meaning the risk continues long after the incident that necessitates a biohazard cleanup. Because of such serious risks, our crews follow all safety protocols and contain, sanitize, and decontaminate all affected and potentially affected areas. Our teams use specialized disinfectants and sanitizers to guarantee a safe environment after cleaning. Some materials and items are not safe to remain in the residence or building. These biohazardous waste items need to be properly disposed of in biohazard disposal bags. These bags are then boxed and taken for proper medical incineration disposal. Disposal of this material is required by law and is one of many reasons you need a professional to handle your biohazardous needs. There are plenty of cleaning crews that might say they can take care of your bioremediation needs, but all cleaning should be handled by experienced crews. When it comes to choosing the right people for your bioremediation, there are a few things to consider. You want a company with experienced biohazard cleaning certified technicians. Our franchise has serviced Dallas Fort Worth for over 30 years, and we have technicians ready to help. We have completed biohazard cleaning for all kinds of situations including crime scenes, trauma, and suicide cleanup. We understand that these calls are often the result of life-changing events, like and untimely deaths. Our staff is professional, patient, and empathetic towards your needs. We know biohazard cleaning situations aren’t easy, and we are here to help. Our crews are available dispatch for 24-hour emergencies every day of the year. We can be reached 24/7 at (972) 986-7677. Call us any time. 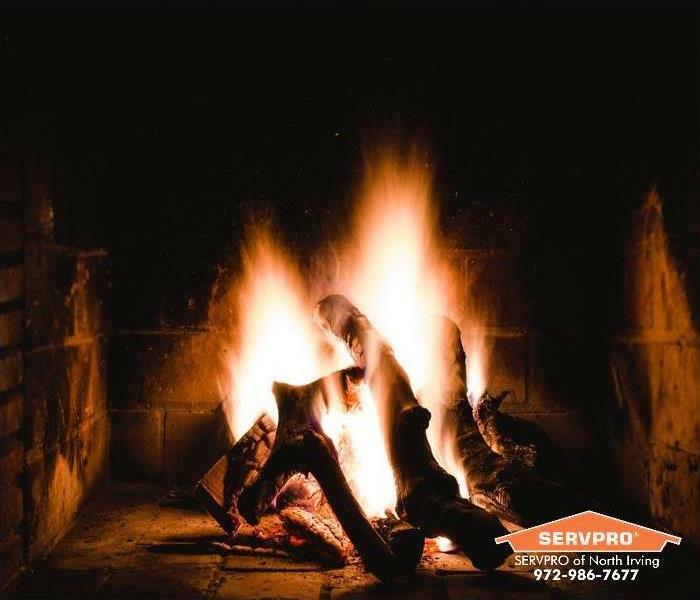 SERVPRO of North Irving is a trusted leader in fire and water damage restoration in Dallas, TX. This isn’t just a catch phrase for us. 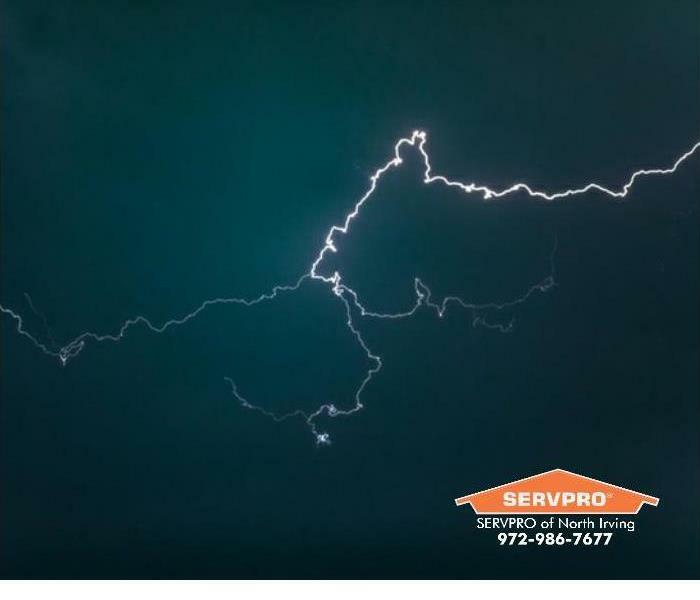 When we say that SERVPRO is faster to any size disaster, we mean it. No other damage restoration company in Dallas Fort Worth will arrive faster to any disaster restoration job with the capability to start cleanup immediately. How do we know we’ll always respond faster? All SERVPRO franchises in the nation uphold the 1-4-8 policy. When anyone calls our business, we are committed to responding within 1 hour. Our office has a live on-call manager 24 hours a day ready to answer the phone as soon you call. We ask you pertinent questions about your emergency and then relay that information to our staff. In our office, every customer is assigned to one administrator and one remediation manager. These two individuals are charged with making sure you are taken care of from beginning to end. Within the hour, they receive your information, understand what has happened, and are preparing crews of technicians to respond. Within the same hour, we will also have technicians dispatched to your property or have scheduled your job for a future time and date of your choice. Within 4 hours of your call, a crew of technicians will arrive at your property ready to work. Our franchise is available to every residential and commercial property in Dallas Fort Worth plus surrounding counties. In most instances, we are able to arrive within 2 hours of your phone call. If the water is contaminated, do not allow any person or pets in the affected areas. Contaminated water comes from sewage backups and storm flooding. To learn more about water contamination, please see our article: Classification of Water and Water Category. Do not handle any compromised electronics. If the water is not contaminated, you may want to pick up objects off the floor to prevent them from getting permanently damaged. Consider picking up rugs, clothing, and toys. If you’re unable to, please wait for our technicians to arrive. If you do pick up items off the floor, be mindful that the water absorption makes items much heavier. Do not strain yourself! If you’re unable to pick up an item comfortably, please wait for our technicians. Do not handle any compromised electronics. It is possible for the smoke particles to have breached inside the machinery and compromised its integrity. Do not stay in an affected room without proper ventilation. In the event where there is a lot of smoke, do not run your air conditioning unit. This may cause soot that settled in the air ducts to blow out and circulate around your property. If the ceiling or walls were damaged, stay away from that area. Do not load soot affected clothing or textiles in your washer and dryer. Household washing machines are not equipped to handle this type of cleaning, and the soot will likely permanently damage your clothing. If you or anyone in your property is experiencing mold symptoms, stay away from the mold affected area. Do not attempt to clean the mold yourself. Improper cleaning will disturb the mold which causes its spores to go airborne. Do not run a fan or the air conditioner in the room with mold. This will cause the mold spores to go airborne. A biohazard is a biological agent that poses a health hazard to humans. These include blood, vomit, and feces. Do not touch the biohazard with your bare skin. If you are filing a homeowners insurance claim, we will start your claims process and make initial contact with your insurance adjuster to let them know we’ve received your information. Within 8 hours of your call, we’ll provide them with the restoration plan our technicians have created, and they will start the beginning documentation of your claim. As your restoration project continues, our administrators will continue to keep in touch with your insurance adjuster. In many instances, we will communicate with them on a daily basis. While we will guide you through your situation, it’s sometimes comforting to know what to expect. Inspection. We will inspect for the extent of the damage in your home and prepare a plan to extract all water and dry your property. Disinfecting. If the water is contaminated, we will disinfect the affected areas. Carpet removal. We will try to save your carpet, but in almost every case, the carpet itself will have to be elevated to allow us to remove the padding underneath. If the carpet is not salvageable, it’ll be completely removed. A small sample of your carpet will be saved to let your insurance company replace it. Carpet restoration services are possible after your property has been dried. Drying. We will set professional drying equipment to remove excess moisture. Drying monitoring. We will visit your property once a day to take moisture measurements and remove equipment as its no longer necessary. Removing excess equipment as we meet our drying goals will reduce your bill. Documentation. We will send all measurements, photos, and the restoration plan to your insurance company. This will help them know your property is being taken care of properly. Learn more about the water removal process by reading our article. Just like water damage, the process for fire cleanup will be different for every property. The general process is as follows. Emergency roof tarping and board up. This will prevent precipitation from entering your property and will also help deter theft. It’s especially important to do this as soon as the fire is out to prevent secondary damage. Many insurance companies will not cover the cost of secondary damage as they consider it preventable and the responsibility of the homeowner to take care of. Water damage restoration. Many times, a fire and water damage go hand in hand since firefighters use water. We will extract all the water to help prevent mold. Inspection. Before work begins, many insurance companies require an estimate of the damage the fire caused. Many adjusters will want to approve our work before anything actually begins. For this reason, we will inspect your property and send the estimate as quickly as possible. Textile cleaning. We are one of the few businesses in North Texas with an Esporta Wash System certification, which makes us qualified to sanitize fire and smoke affected clothing. Demolition. If any portion of a property is permanently damaged, we will perform demolition. Moving and storage services. In almost every case, an entire home’s contents have to be packed and moved out of site in order for the home to be cleaned. Fire damage cleanup. Cleanup includes the removal of all soot, air duct cleaning, and odor removal. Cleaning household items. When items are taken out of a home, they are transported to our cleaning facility where they are also cleaned and deodorized. Reconstruction. If any portion of the home needed demolition, we will reconstruct it. To learn more about our fire damage cleanup process, please read our article. Containment. To prevent mold spores from traveling to other parts of the property, we will set up floor to ceiling containment as remediation occurs. HEPA vacuum filtration. During mold remediation, we may run HEPA vacuum filtration to clean the air. Demolition and Reconstruction. If the mold was on an item long enough, it may have damaged it permanently. In this case, that part of the property is taken out and replaced. 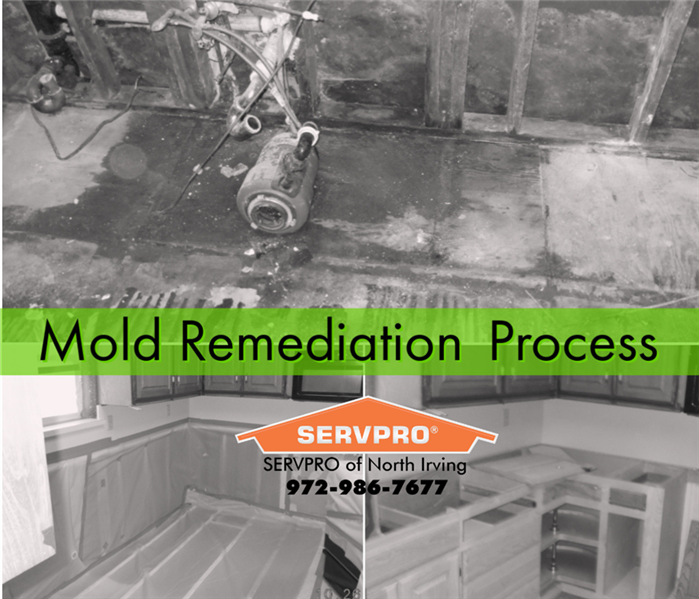 To learn more about our mold remediation process, please read our article. Our 4-hour policy holds true in almost every case. Please note that in extraordinary circumstances where widespread storm damage is happening, we may not be able to arrive within 4 hours. While these cases are rare, we will give you an estimated time frame for our arrival and call you as we’re on the way. During storm situations, please be vigilant of unreputable water damage companies or individuals claiming to be Texas disaster restoration experts. It is understandable to want help to arrive as fast as possible. During storm situations, our office activates its Storm Protocol to reach as many people as possible in the shortest amount of time. Our crews work around the clock to make this possible. Just as important as receiving quick service is receiving the proper service. Improper water damage cleanup can lead to more property damage, including mold growth. When a community is in need, it’s an unfortunate fact that some people are taken advantage of by unknown companies claiming to help. These people typically solicit work door-to-door and ask for a cash down payment before promising to begin work. With money in hand, they often leave town after either doing a poor mitigation job or not beginning work at all. Please be mindful of fake disaster restoration companies during storm situations. Learn more about reputable restoration companies by reading our article. SERVPRO of North Irving is a leader in the restoration industry. We are based out of Dallas, TX, and we have helped restore communities in our home of North Texas for over 30 years. We have performed restoration services in Dallas, Grand Prairie, Garland, Plano, Waxahachie, Midlothian, and other North Texas communities for over 30 years. With our crews responding immediately to jobs, we are faster to any size disaster. We also have a Texas Mold Remediation Contractor License and offer free mold inspections. We are a family owned and operated business. Learn more about us. SERVPRO North Irving specializes in water damage restoration in Dallas Fort Worth. We've restored thousands of homes and businesses since 1986. What was already a difficult situation for the Johnson family became more of a headache when they found out their flooded home had mold growing underneath their flooring. The mold was discovered during water damage cleanup when a severe storm flooded their backyard and the water flooded their kitchen and living room. What was supposed to a typical flood repair in Dallas ended up also becoming black mold remediation. Months before the storm, the Johnsons had what they thought was a small leak behind their refrigerator. They called a plumber who fixed the leak, and the family mopped up the water themselves. They thought that would be the end of their small water damage, but it was only after their floor was ruined after the storm and the boards were pulled up that they realized their previous water damage was actually the cause for mold growth underneath their wood floors. When a severe storm in Dallas dumped inches of rain in a matter of a few hours, the Johnson’s yard began to flood. The family attempted to keep the water out by putting all of their towels underneath their sliding door to their backyard. Yet, the water still rose above their door’s threshold when their drainage system became clogged from storm debris. When our technicians arrived at the Johnson's house, the first thing we did was remove the storm damage debris from their yard in an effort to help the yard drainage begin to work. This helped alleviate some of the problem, but there was still water inside the house that needed to be extracted immediately. Water from floods that rises from the ground up is considered to be contaminated. We consider this water to be Category 3 which means it has the potential to be hazardous to a person’s health. The reason flood waters are considered contaminated is because they have touched the ground where many pesticides and other unknown factors have mixed with it. When our technicians are cleaning Category 3 water, they take into consideration the safety of all occupants. We spray sanitizer before and after water removal to make sure that everyone is safe during the water removal process. Learn more about water categories by reading our article Classification of Water and Water Category. Because storm damage water is contaminated, properties that experience flooding need demolition. This is why many homes that needed flood cleanup in Texas after Hurricane Harvey had a portion of their drywall cut and removed. For the Johnsons, this was also the case. The drywall the water had touched was permanently ruined and had to be removed. Unfortunately, this was also true for their flooring in their kitchen and living room. It was when the kitchen and living room flooring was being removed that we found mold growth underneath the boards. Because the family had called us immediately when the water came in from the storm, we knew that not enough time had passed for mold to begin growing from the storm’s water damage. Instead, what we found was mold from their previous water damage which we traced back to their refrigerator leak months ago that was not properly remediated. It was at this point that what was already a difficult situation for the Johnson family became more of a nightmare as we needed to now include mold remediation as part of their cleanup project. Upon discovering mold, our licensed mold contractor visited the Johnson’s property. The mold that was present in the house was on the kitchen floor and the adjoining living room floor. We came up with a mold remediation plan and got to work immediately. In order to prevent the mold from going airborne and traveling to other portions of the Johnson’s family house, our technicians installed mold containment. Mold containment is when we isolate the mole infested areas in the home with a floor-to-ceiling covering. We also installed HEPA vacuums two remove airborne particles. For the Johnson family, this meant that mold containment was set up both in their kitchen and their living room. With the containment set up and the HEPA vacuums running, our mold remediation technicians removed the Johnson’s flooring and began removing the black mold in their home. It’s not uncommon to find black mold in Dallas Fort Worth, especially after water damage restoration. The natural environment found in our area of the world is conducive to this type of mold. While many articles have been written about mold symptoms related to the toxicity of black mold such as Stachybotrys Chartarum, there are actually thousands of different types of molds, many of which also have a black color. To learn more about mold symptoms, please read Mold Allergy Symptoms by the Mayo Clinic. Because of the Johnson’s flood, we had to make sure that their property was properly dried. Correct structural drying helps prevent damage to walls and flooring, and it also helps prevent future mold. Our team set-up dehumidification equipment and created a drying plan. The Johnson’s property was monitored every day to make sure that our drying plan was proceeding and working to plan. Every insurance policy is different, and only your insurance company can tell you what your policy covers in the event of water damage to your home. If your insurance company considers your water damage to be caused by a flood, they may not cover your claim. For this reason, it is important to consider flood insurance for your property, especially if you live in a flood zone. Fortunately, the Johnson family had considered flood insurance before and purchased a policy that covered the cost of their storm caused water damage remediation. Their regular homeowner's insurance covered other costs of their mold remediation. If you're unsure if you're living in a flood zone please check out FEMA's website here. Even though we do not live in a coastal region, there are still many flood zones in Dallas. If you are interested in purchasing flood insurance, contact an insurance agent that can sell you a policy. To learn more about flood insurance, read FEMA's article The National Flood Insurance Program. Many water damage companies are only able to help you extract the water and dry your structure. But when demolition needs to happen and your drywall has been cut away and your floor removed, the next step to actually getting your property back the way it was before the damage is to rebuild what was torn out. We are one of the few full-service Texas disaster restoration companies that can handle your Dallas restoration claim from beginning to end. For the Johnson family, this meant that after we were done with their mold remediation and their water damage, our reconstruction team was able to get their homeowners insurance to approve the replacement of the drywall, fresh paint, new floorboards, and a new floor for their kitchen and living room. Whenever you have water damage, no matter how small it is, it’s a necessity to get your property dried. Mold grows and dark, moist environments and will continue to grow unless it is removed completely. Even a few mold spores can end up causing property damage if it's allowed to fester. There are many companies that offer mold clean up in Dallas. Make sure they are licensed by the State of Texas, and choose one that also offers reconstruction services in case they need to demolition any part of your home. If you've taken care of what was a small water damage and you are wondering if you have properly dried your home, give us a call. We will be able to inspect your property and check for any wet spots that may have been missed. To learn more about preventing mold after water damage, read our article. 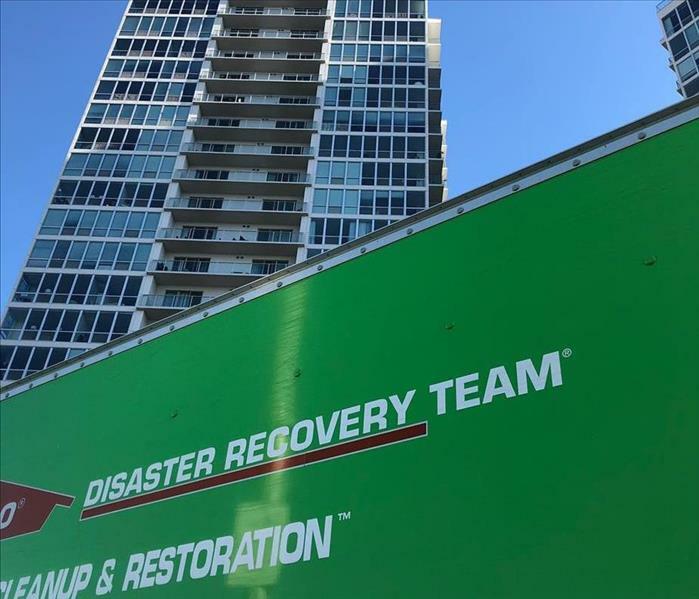 SERVPRO of North Irving is a trusted leader in Texas disaster restoration. We are an expert mold removal company in Dallas, TX, and we have helped restore thousands of homes and businesses in our hometown for over 30 years. We know how to properly clean and restore all properties, and we have performed residential and commercial restoration in Dallas, Fort Worth, Lewisville, Garland, McKinney, Waxahachie, and Plano, TX. Our SERVPRO in Dallas franchise also has a Texas Mold Remediation Contractor License. We offer free mold inspections in Dallas and all North Texas. Besides residential services, we also offer commercial mold remediation. You can trust us to handle all your residential and commercial restoration and cleaning service needs. We are locally owned and operated. Learn more about us.